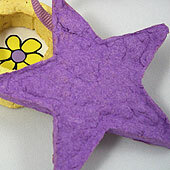 Use this craft recipe to quickly make a colorful papier-mâché pulp that can be molded into shapes. 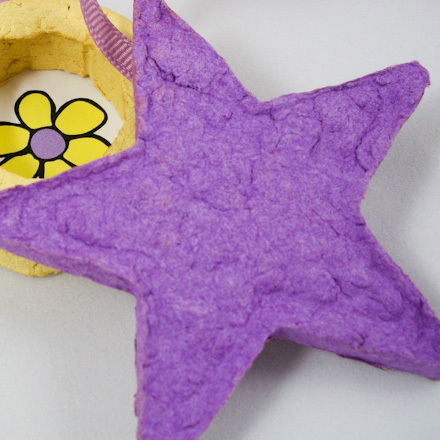 This paper pulp doesn't require glue, and you can skip painting the finished pieces. This is a great craft material to use for family, group or classroom crafting time. 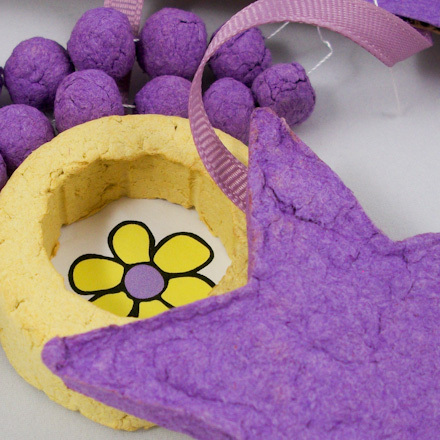 Depending upon the age group, you may want to make the papier-mâché pulp in advance. 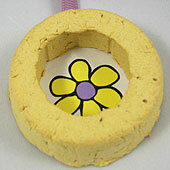 Use the pulp to make shapes molded by hand, spread over molds or pressed into cookie cutters. The dried shapes are extremely lightweight and are ideal for mobiles or jewelry. This recipe is rated EASY to make. 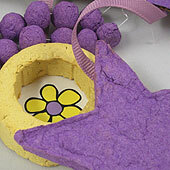 Tear the construction paper into small pieces (½") into the mixing bowl—be sure that the edges are ragged. Use one 12" by 18" sheet (A3) or two 9" by 12" sheets (A4) in any color you like. Pour 2 cups of boiling water over the paper pieces, stirring to make sure all the paper pieces are wet. Let it sit until cool. Pour the paper and water mixture into a blender and liquefy into a slurry. Pour the slurry through a strainer or cheesecloth bag, then squeeze to remove excess water. Store the papier-mâché pulp in a plastic bag in the refrigerator until you are ready to use it. Mold the pulp into shapes of your imagination using your hands—pressing hard as you go to remove excess water. Set aside to dry on paper towels or a wire rack. Shapes may take a day or two to dry depending on thickness and humidity. You might make beads in various shapes and sizes—just be sure to squeeze hard and make a hole with a needle for string or a cord. It's also fun to make shapes using cookie cutters. Place the cookie cutter on a piece of foil and mold the foil around the cookie cutter. Fill the cookie cutter with pulp, pressing hard with paper towels or a sponge to remove excess water. Fill the cookie cutter to a depth of at least ¼". Lift the cookie cutter from the foil and, using folded paper towels or the sponge, gently push down on the shape to remove it from the cookie cutter. Leave to dry on a wire rack. How will you use the papier-mâché pulp? 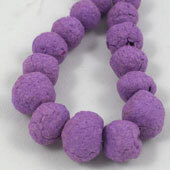 Tip: Beads made from papier-mâché pulp are lightweight and durable. Tip: Cookie cutters are good molds. Use the resulting shapes as ornaments or in mobiles. 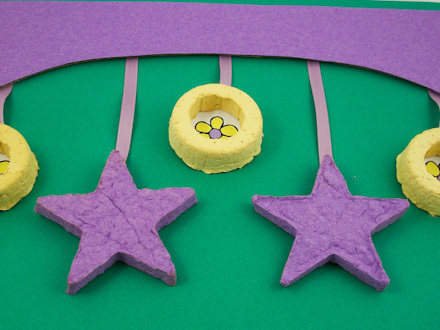 Tip: It's easy to make a papier-mâché frame. 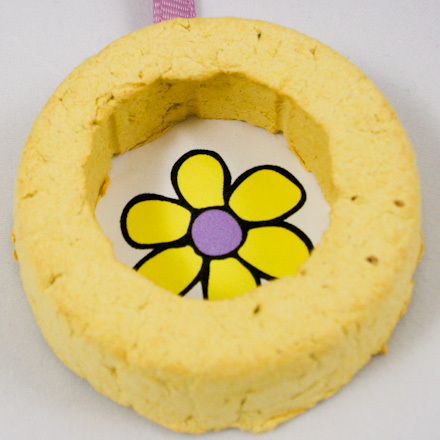 Place a lid in the center of a cookie cutter or biscuit cutter and pack pulp around it.